Sony's multi-touch screen is the latest to join battle with the Apple display. When a company as traditional as Sony gets in on a new or niche technology, you just know it's set for the big time, so its newly unveiled multi-touch screen looks like becoming the latest to do battle with the one found in Apple's iPhone. The troubled Japanese giant has signalled its intent by showing off a prototype LCD that can handle five inputs at once. That's three more than is possible on the iPhone and equivalent to the other multi-touch contender we've seen from Sharp. Like Sharp's effort, the Sony LCD measures 3.5 inches on the diagonal, has optical sensors embedded in the screen and has a 640 x 480-pixel resolution. While it's not immediately obvious why anyone would need to stimulate a screen five times at once, we've had a spin on the Sharp device and can see how three at least can be used. In that case, we found it far easier to manipulate an on-screen map using three fingers rather than two or just one. As for Sony's plans for the display, nothing was announced, but we do hope it comes up with something more imaginative than the doodling concept you see above. 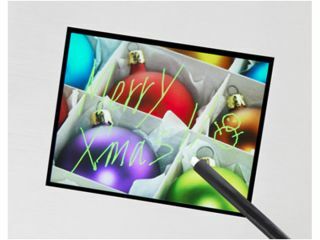 On the technical side, Sony says its new technology uses a low-temperature polysilicon display that creates an exceptionally thin surface in keeping with the current trend for slim screens. Testing samples will be made available to hardware builders shortly, but there is no timetable in place for consumer use yet.